Become creative and paint original MAROLIN® paper mache figures on your own! The figures can be painted using nearly all common colors such as watercolors or acrylic. After the painting you can fix the colors using varnish and apply a patina. 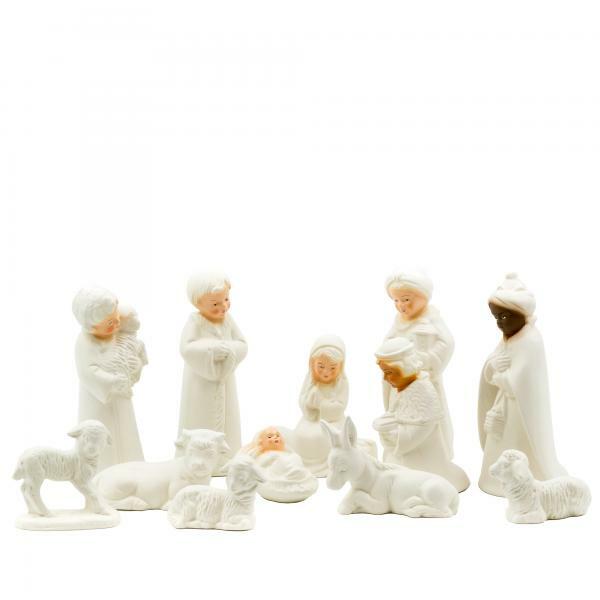 The Children Nativity set contains twelve figures that usually belong to a complete crib set: Holy Family, Three Wise Men, donkey, ox and a shepherd with three sheep. The faces of the human figures are pre-painted, so can free create the color design of the clothes of the figures. Customer evaluation for "Craft set Children nativity - Figures to paint - prepainted faces"